Combining our Kenya and Tanzania safaris for a two-week journey of adventure that is more than just one wildlife park after another. Discover the contrasting scenery, wildlife environments and cultures as you travel through these most spectacular safari destinations. 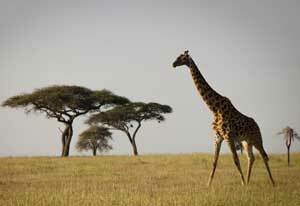 This safari starts in Kenya and finishes in Tanzania - (see When we go). 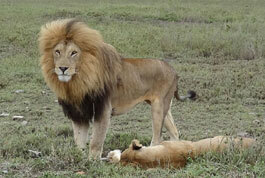 Depart Nairobi for the 3 hour drive to Lake Nakuru and late morning and afternoon game drives. This small but spectacularly picturesque park abounds with wildlife and you've an excellent chance of seeing the rare rhino, (both black and white), lion, leopard, vast herds of buffalo and the unusual Rothschild's giraffe. 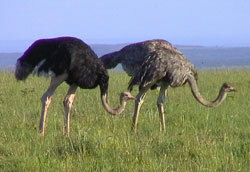 It has also had nearly 400 species of birds recorded within its boundaries. Overnight at guesthouse right next to the park. Another early morning game drive in Lake Nakuru then on to a Kikuyu farmstead by Lake Elementaita – imagine ‘Little House on the Prairie’ in an African setting. Lunch and afternoon tea, exploration of the subsistence farm (they grow almost any tropical foodstuff that can be grown), and walk along the lakeside. There are hot springs with amazing heat tolerant fish (accessible if lake water not excessively high) and often thousands of pink flamingo and pelicans. 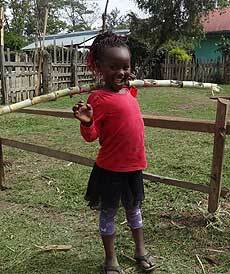 On to Lake Naivasha and overnight in boutique cabins by the lakeside. A short drive to Hell’s Gate, one of the few national parks where visitors are allowed to walk freely, strolling amongst zebra, hartebeests, buffalo, gazelles and giraffes, impala and ostrich, with chances of spotting the rare Lamergeyer vulture; all these against a dramatic volcanic backdrop of soaring lava cliffs. You’ll also walk down the steep sided gorge past steaming volcanic vents and hot springs. Return for lunch by Lake Naivasha, a vast freshwater lake, famed for its hippo and bird life, particularly fish eagles, love-birds and pelicans. Then take a boat trip in the afternoon to see some of them close up. Overnight again in boutique cabins by the lakeside. Leave after breakfast for a 3-4 hour drive to a tiny Maasai settlement in the bush for insights into their fascinating way of life. Here you can visit traditional homes, observe or engage with day-to-day life, and immerse yourself amongst myriad other serendipitous activities which invariably crop up; or just relax and watch the savannah. Dinner by the camp fire, starlit skies, and the sounds of the African night - often hyenas calling very nearby. Overnight in Maasai style eco-cabins in a tiny camp. 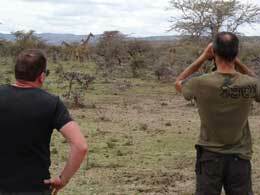 Early morning walk through the savannah with the Maasai as guides and interpreters of their lands, often spotting giraffe, impala, zebra, wildebeest, baboons – even elephant. During term times there will also be an opportunity to visit a tiny primary school (part of the Enkiteng Lepa Maasai Women’s project we support here). 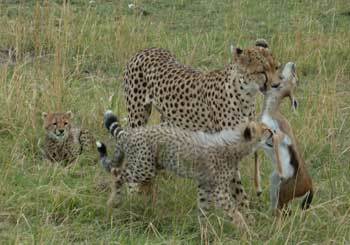 Early lunch and then 2 hour drive to Masai Mara with game viewing opportunities all along the way. Overnight in a permanent tented camp right on the edge of the reserve. 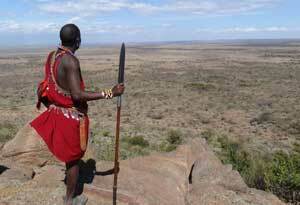 Ecologically the Masai Mara is an extension of the great Serengeti plains and teems with wildlife. Up at dawn to spend a full day in the reserve where you almost certainly will see elephant, buffalo, lion, zebra, giraffe, hippo, crocodile and a whole ark-full of other animals. From mid-July through to mid-October the Mara is home to the wildebeest migration. Rhino, cheetah and leopard are seen on 2 out of 3 visits but our expert naturalist guides and 4WD vehicles ensure you have the best chance of seeing them all. Overnight in a permanent tented camp right on the edge of the reserve. 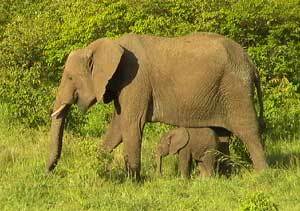 Another early morning game drive and further chance to catch any of the animals you may have missed so far. Then drive back past the Mt Susua and Mt Longonot volcanoes and a final stop for breath-taking views over the Great Rift Valley before reaching Nairobi in late afternoon. Overnight central Nairobi hotel. 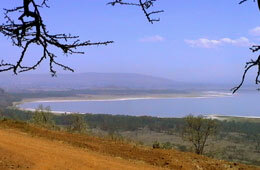 Private vehicle transfer to the Namanga border crossing into Tanzania – less than 3 hours’ drive. 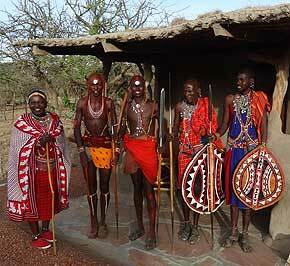 Here you will meet our Tanzanian crew and make a short drive to Longido for Maasai lands and life experience. With local Maasai guides you visit traditional huts, spot animals and an astonishing variety of birds on a walking safari, find out about the medicinal uses of the savannah plants, and learn from an elder the history and culture of these fascinating people. 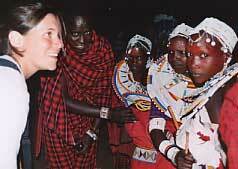 Overnight in simple but delightful lodge run as a Maasai community resource. On to Lake Manyara in the great Rift Valley for a game drive. 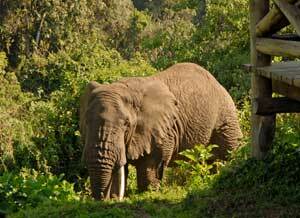 Famed for its unusual tree-climbing lions it also has a large elephant population, hippos in its freshwater springs, rich bird life in the forests and often thousands of flamingos on the soda lake. Late in the afternoon, climb up to the Crater Highlands and lodge accommodation on the edge of the Ngorongoro Conservation area. Short drive to nearby centre of Karatu and a leisurely walking safari through farms and villages on the rift valley escarpment. You discover the farming, irrigation and cattle husbandry techniques, visit houses and, if you want, sample local cuisine of the Iraqw tribe. There is also traditional wood-fired brick making, local musicians and you generally gain a deeper understanding of the lifestyle of the people who live here. Visit the nearby village market or relax in afternoon back at the lodge and overnight. Drive to the Serengeti! Lunch en-route at Olduvai Gorge and a view of the archaeological sites (and visit the museum) where early human tools and fossils have been found. Afternoon game drive in the rolling grasslands. Criss-crossed with forested riverine valleys, the Serengeti plays home to millions of Africa’s large mammals, making this one of the world’s most famous wildlife destinations. Overnight at a campsite in the heart of the Serengeti. Modern toilets and showers, but not en-suite. All day game drives in Serengeti. Best time for the wildebeest migration is December to June but there are spectacular wildlife sights at any time of year. Overnight again at central Serengeti campsite. 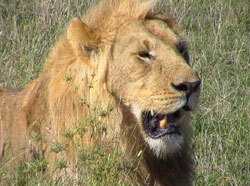 Further morning game drive in Serengeti and then back across the grasslands and up to the Ngorongoro Crater. Tonight we stay in a lodge owned and run by the Maasai here; located in the Crater forest, it is quite common for zebra, buffalo and even elephant to be grazing right outside your window. 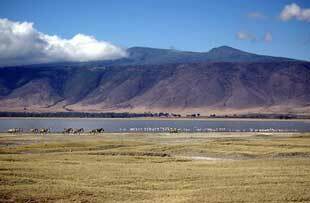 Ngorongoro is collapsed volcano - an incredible natural amphitheatre, 25 km across and teeming with all of the African big game. Early morning descent into the crater for spectacular scenery and game viewing in what has been described as the eighth wonder of the world. Return to Arusha for mid to late afternoon. We can also arrange airport transfers and accommodation in Nairobi and Arusha for before and after your trip. All camping equipment on the two nights required including mattress, pillow, sleeping bag and cotton liner.